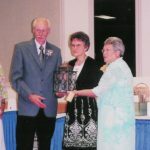 The old adage – prevention is the best medicine – holds true for growing lilies successfully. 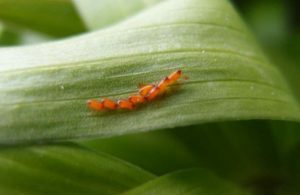 The best way to avoid damage caused by pests and diseases is to ensure you have healthy, strong lily plants with the resources available to withstand a minor event. Start by purchasing healthy plants or bulbs, and give them the best possible growing conditions, suited to their needs. This means full sun (for most types) nutrient-rich soil, excellent drainage, even moisture and good air circulation. 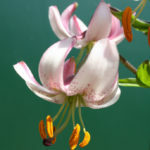 However, even in these ideal conditions, lilies are known to be susceptible to the following diseases and pests. Fungal pathogens prefer moist, warm conditions and it is during times of persistent moisture that fungal diseases become more prevalent. The use of high nitrogen fertilizers causes lush, soft tissue which makes it easier for the pathogen to infect the plant. 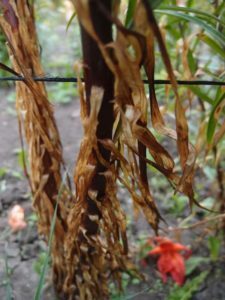 Damaged bulbs or leaves can provide a physical opening through which the pathogen enters the plant.The two most serious fungal diseases of lilies are botrytis and basal rot. 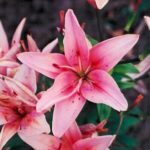 Botrytis affects the above ground portion of lily plants – leaves, stems, and in more extreme cases the flowers and buds. The health of the bulb declines as affected leaves become less photosynthetic, but if the bulb is not affected the plant can often regrow the next year. 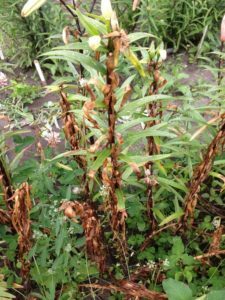 If the disease is present for three or more years in a row, the plant may succumb. The disease begins with small light spots on the leaves usually starting at the bottom of the stem. The spots expand becoming darker in the center and lighter on the margins. Greyish mould may occur, and eventually the entire leaf is effected, becoming thin and brittle then falling off. The stem can also be effected causing the plant to collapse. Spores found on the underside of leaves are spread by the movement of plant debris, by wind, rain, and water splashes and survive over the winter on the leaves. Botrytis can spread rapidly if the conditions are right. To minimize the chances of getting botrytis avoid overhead watering and water early in the day. Mulch may help minimize rain splashing up from the soil which can spread the spores and good air circulation will allow foliage to dry quickly. Fungicidal sprays can be applied to help prevent the disease from becoming established. Bordeaux (or Bordo) mixture is commonly recommended – a combination of copper sulfate (prevents germination of fungal spores) and slaked lime. This product can be purchased, or the ingredients are available for those that prefer to mix it themselves. (See the end of this article for websites that provide detailed instructions). Recommendations suggest spraying the foliage after any kind of damage (ie. hail) or as soon as spots are seen, then repeating every 2 weeks, applying only when leaves are dry.Prevention of botrytis is also aided by the removal and burning of all garden debris. Basal rot affects the basal plate (base of the bulb) from which the roots develop downwards, and to which the fleshy scales (leaves) are attached. The soil born fungus enters through the root and works its way up the plant. Spores are carried in the soil or on infected plant tissues and can be spread by tools, infected bulbs and even potting soil. Above ground symptoms include yellowing of the leaves, stunting of growth and in some cases premature death of the plant. Below ground, a dark brown rot is seen on the bulb parts and the roots may die. Underground bulblets may be infected, but above ground stem bulblets should be healthy and in fact may be produced in larger numbers. These can be harvested for replanting, but be sure to pick a new location, as the organism can live in the soil for years even without a host. It͛s also possible to save the bulb by removing the infected scales and then dipping the bulb in a fungicide solution. Avoid basal rot by avoiding over fertilizing and damage to bulbs by mechanical means or by insects. Also beneficial is the use of mulch to reduce soil temperature, and taking measures to improve soil drainage. Viruses are very simple organisms that only exist inside the cells of their host. Plant viruses are typically spread through piercing-sucking insects such as aphids and thrips. Cell function is disrupted causing visible symptoms on the plant such as streaking, puckering or twisted growth, reduced plant size and stunted flowers. You may also see colour breaking (mottling or streaking) in the flowers and leaves. Many tulips that display colourful stripes or streaks owe the presence of these patterns to the tulip breaking virus, which can be spread to lilies. It is best to avoid planting these tulips near any lilies. Viruses can͛t be controlled with any kind of spray or treatment. To prevent their spread, be sure to remove and destroy any infected plants, including all bulbs and scales – viruses are not carried in seeds, only in vegetative plant parts. Insect populations that might spread the virus can be controlled through conventional methods. 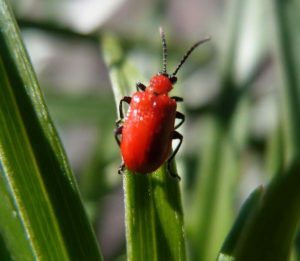 The most talked about pest of lilies over the past few years is the lily beetle (Lilioceris lilii). It is native to Asia but found its way to Europe and North America. Its first sighting in Canada was in Montreal in the early 1940͛s. 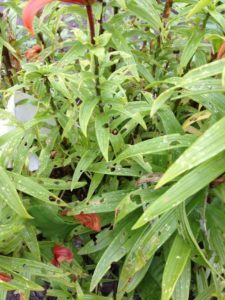 Only a few years ago, Alberta was essentially lily beetle-free, but it is now considered a major pest on lilies in Alberta, to the point that some gardeners have sworn to remove all the lilies from their gardens. Serious indeed. 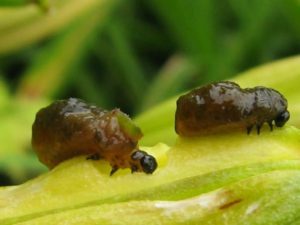 The concern is due to the damage that the insect is capable of, as the larvae and adults feed on lily leaves, in some cases stripping the plant completely.The main hosts of the lily beetle are members of the Lilium genus, which includes all true lilies. It also often feeds on lily of the valley, Solomon͛s seal, fritillaria and even potatoes and nicotiana. three weeks before dropping to the soil to pupate, emerging as adults approximately three weeks later. 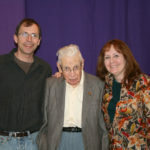 Generally there is only one generation per growing season, but it may be possible for there to be up to three generations per year if the conditions are right. An individual beetle may survive for two growing seasons. Control of these insects is challenging. For small infestations, hand control may be the best option. Hand picking and killing the adults, eggs and larvae by squishing or drowning (use a bucket with water and a few drops of vegetable oil and dish soap) can be rewarding, but time consuming. 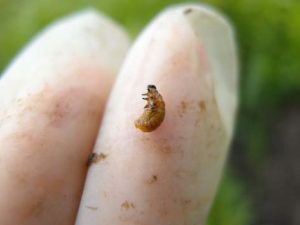 In the lily beds at Olds College we pick larvae and adults two times a week throughout the season. For those not adverse to using chemicals there are some available, however the reports of efficacy vary greatly. Contact chemicals may be effective but must be applied directly to the pest. References can be found to the effectiveness of ͚Rose and Flower͛ spray or dusting products that contain carbaryl (Sevin) or malathion but there is no hard evidence to support this. Olds College is involved with a research project intended to test the efficacy of a parasitoid wasp as a biological control agent. However it will be some time before the wasp would be available to the home gardener.